Have you ever wonder that how an ANPR (Automatic Number Plate Recognition) system works? Let me tell you the concept behind it, the camera of the ANPR system captures image of vehicle license plate and then the image is processed through multiple number of algorithms to provide an alpha numeric conversion of the image into a text format. ANPR system is used at many places like Petrol Pumps, Shopping Malls, Airports, highways, toll booths, Hotels, Hospitals, Parking lots, Defense & Military check points etc. First, let me brief you about the concept we are using for detecting number plates. There are three programs or ‘.m’ files for this project. Template Creation (template_creation.m)– This is used to call the saved images of alphanumerics and then save them as a new template in MATLAB memory. Letter Detection(Letter_detection.m) – Reads the characters from the input image and find the highest matched corresponding alphanumeric. Plate Detection(Plate_detection.m) – Process the image and then call the above two m-files to detect the number. Now, we will learn about how to code these m-files and what you have to do before start coding. After going through this tutorial, you can find all the code files and working explanation video at the end of this project. First create a folder for the project (my folder name is Number Plate Detection) to save and store the files. We have stored the binary images of all the alphabets and numbers in the sub-folder named as ‘alpha'. If you are not familiar with the basic terminology of MATLAB I suggest you to check the linked tutorial. Now, copy and paste the below code in template_creation.m file, and save the file in the project folder (Number Plate Detection). All the files related to this project including image templates files can be downloaded from here. Also check the video given at the end of this project. Where A is the variable, and in ‘alpha/A.bmp’, ‘alpha’ is the folder name and ‘A.bmp’ is the file name. Then create a matrix of ‘letter’ and ‘number’ and save it in variable ‘NewTemplates’ by using command ‘save(filename,variables)’. Now start coding Letter_detection.m, in a new editor window. Here we are creating the second code file named Letter_detection.m. Now, copy and paste the below code in that file and save the file in the project folder with name Letter_detection. 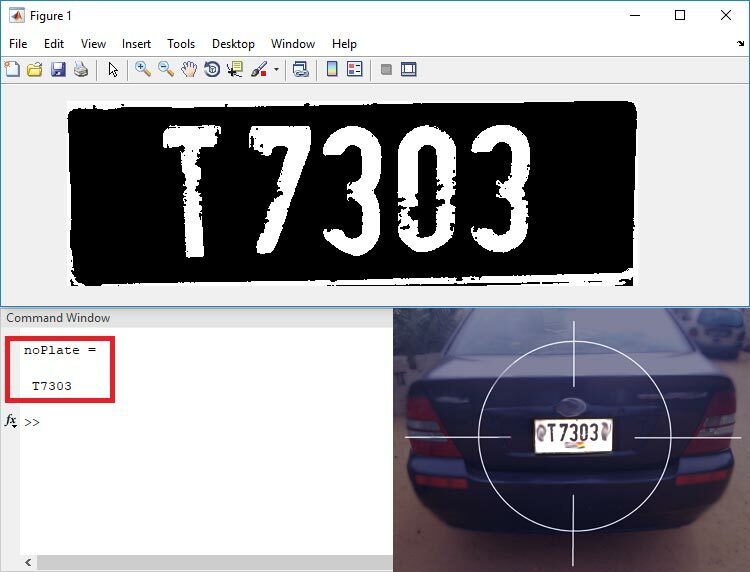 This file can be downloaded from here, this attached zip files also contains other files related to this Number plate detection project. Here, in the above code we have created a function named letter which gives us the alphanumeric output of the input image from class ‘alpha’ by using command ‘readLetter()’. And then load the saved templates by using command load ‘NewTemplates. After that, we have resized the input image so it can be compared with the template’s images by using the command ‘imresize(filename,size)’. Then for loop is used to correlates the input image with every image in the template to get the best match. Then ‘find()’ command is used to find the index which corresponds to the highest matched character. Then according to that index, corresponding character is printed using‘if-else’ statement. Now, after completing with this open a new editor window to start code for the main program. Here is the third and final code file named Plate_detection.m copy and paste the below code in this file and save into the project folder. For quick start you can download all the code files with image templates from here. imread() – This command is used to open the image into the MATLAB from the target folder. rgb2gray() –This command is used to convert the RGB image into grayscale format. imbinarize() – This command is used to Binarize 2-D grayscale image or simply we can say it converts the image into black and white format. edge() – This command is used to detect the edges in the image, by using various methods like Roberts, Sobel, Prewitt and many others. regionprops() – This command is used to measure properties of image region. numel() – This command is used to calculate the number of array elements. imcrop() – This command is used to crop the image in the entered size. bwareaopen() – This command is used to remove small objects from binary image. By using the above commands in the code, we are calling the input image and converting it into the grayscale. Then the grayscale is converted into the binary image, and the edge of the binary images is detected by the Prewitt method. After that crop the number plate and remove the small objects from the binary image by using command ‘imcrop()’ and ‘bwareaopen()’ respectively. Then, the below code is used to process that cropped license plate image and to display the detected number in the image and text format (in the command window). Complete working of Vehicle License Number Plate Detection System is demonstrated in the Video below, and all the code files with image templates can be downloaded from here. Also, check all MATLAB Projects here. Brace indexing is not supported for variables of this type. Will you please help me for the same..
did u find any solution to this problem? Please Reply for the above problem.